After the market crash of 1987 investors realized that the market could crash at any time. "A Black Swan event is an event in human history that was unprecedented and unexpected at the point in time it occurred." The crash made investors rush out and protect their portfolios through option insurance. This new demand shook the options market into what we see today. One of the things that spawned off this action is the forming of volatility skew. Volatility skew also known as volatility smile is the difference in implied volatility between out of the money, at the money, and in the money options. By looking at the aftermath of the market crash we can understand why skew exists, why it is essential, how we see it in our everyday trading, how we can use it in our options trading and how you can see it in your option chain and trading platform. The majority of market participants hold long stock, usually over the long-term. Think of how many positions and the size of those positions mutual funds hold or retirement accounts such as 401-ks. A mutual fund, retirement accounts or other large portfolios can't just enter and exit positions on a whim, so they need a way to protect themselves against a market downturn. These investors go into the market and purchase portfolio insurance. Insurance, in stock market terms, comes in the form of long put options that are deep out of the money. If the market begins to crash these cheap out of the money puts are suddenly worth a lot of money. What happens when people purchase options? It drives up the price and volatility of those strikes. We compound this even further by noting that when it comes to short options or writing options, the majority is done through calls in the form of covered calls. Covered calls are widely used because they are a good beginner strategy, the pair well with a long stock portfolio and they can be traded in retirement accounts. What happens when people sell options? It drives the price and volatility lower in those strikes. This is how we get higher volatility for out of the money puts versus out of the money calls. This phenomenon can seem in just about every equity option class. There are times when the skew will fall out of whack, usually heavy buying in out of the money calls but these occurrences are few and far between. We now know that equity skew is caused because there is a fear of the downside. Commodity traders don't fear the downside. However, they fear the upside. Think about the use of crude oil and how many companies need it to run their business and manufacturing plants. When crude goes down, these companies increase their margin and profit, and everyone is happy. When crude begins to rise it puts a strain on these companies, so they protect themselves through the use of long calls. Not only do these purchase long calls but they will sell puts to pay for the long calls. This demand drives up the volatility in out of the money calls and pushes down the volatility in out of the money puts. How many calls and puts do you think airline companies trade to protect against rising oil price? Knowing that skew exists and why it exists is important, but now we need to know how and why to use it in our trading. First, we will lay out some more obvious cases of where we see skew but don't realize it. As net option sellers, we often get the question of why we focus on selling puts versus selling calls. Many many years ago when we first came into option selling, we sold both calls and puts pretty regularly. We always went deep out of the money on both but realized that our calls would get pressured more and take more losses when compared to our puts. The reason for this as we came to learn, and as you did today, is that option skew places our calls closer to at the money than it did our puts. Our puts could be 8% out of the money, but the calls were only 4% of the money. If we took the calls to 8% out of the money, they didn't have any premium in them and were not worth selling. This is why we focus on selling put options even in a down market. The skew in our options allows us to go deep out of the money and still make a decent return on each play. Most traders will sell calls not knowing how close to at the money they are and they hurt their portfolio when it turns against them. We are not advising against selling calls because they can be very profitable but now you will be more aware when you do. Another trade we see the effects of skew is with iron condors. Iron condors are always talked about as being non-directional and market neutral. Theoretically, this is true. You want your underlying to remain in the middle of a big range which in essence is market neutral. In reality, you are not neutral, and this can be seen in your condor's deltas. Your deltas are negative making your net short because your put delta is going to be smaller than your call Delta. If your underlying begins to rise your condor is going to turn against you very quickly. We see this happen all the time when traders don't take into account skew and volatility in their condors. Now there is no way to combat against your negative deltas, but you can time your entry when volatility is on the way down. Trading straight calls and puts and vertical spreads can make great use of skew. The slope of volatility is not linear, and the pricing of options can fall out of whack. If a particular strike is getting bought or sold more than the strikes around it you can see that it will be worth more or less, respectively. By looking at skew, you can increase your probability of success by buying the strike with the lower volatility and selling the strike with the higher volatility. This will start your trade-off with volatility already in your favor. The easiest way to see the skew in options is through a program that has that feature built in, but these programs can be costly and too advanced for newer option traders. You can view skew through your trading system and by studying your option chain. Let's return to talk about vertical spreads and using the skew to trade them. Take, for example; we want to put on a vertical spread on The Option Prophet (sym: TOP) and not risk more than $1000. We can either enter a vertical spread that is 1-strike wide for .10 credit or 2-strikes wide for .18 credit. Which one shall we choose? To know which one to choose we need to make this a fair comparison. If we trade the 1-wide strikes, we risk $90 per contract or $990 per 11 contracts. If we trade the 2-wide strikes, we risk $182 per contract or $910 for 5 contracts. Now we can compare the returns to see which trade we should take. The 1-wide strike will make a total credit of $110 or an 11.11% return on risk. The 2-wide strikes will make a total credit of $90 or a 9.89% return on risk. The obvious choice here is to take the 1-wide strikes. If strikes and volatility were linear, a 1-widespread would get us 0.10 credit, 2-widespread 0.20 credit, 3-widespread 0.30 credit, etc. in this example. Due to skew, we get different prices for these options. The one thing we left out in our example is commissions. You need to factor commissions into your assessment because it will cost you more to put on 11 spreads versus 5 spreads and it could make the 2-wide strikes a better choice. Through the use of a spreadsheet and our option chain, we can derive skew by recording the implied volatility of several strikes each day. This may be a tedious process but seeing how skew moves and changes every day can give you great insight into the future market direction and current sentiment. When recording our implied volatility, we want to look at 10 Delta put, 20 Delta put, 50 Delta call, 25 Delta call, and 10 Delta call. 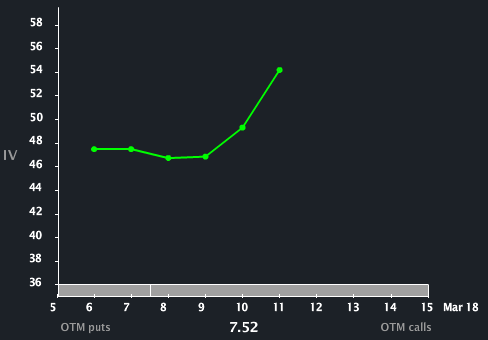 This range of options will give us a clear look at how skew is performing and moving. Understanding volatility skew may seem like an abstract concept when trading options but as you now know, we see the skew in our everyday option trades. 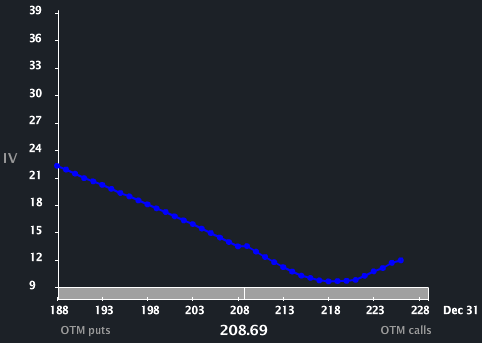 Skew shows itself when trading short options, vertical spreads, and iron condors. It can set us up for losing positions before we ever even know about it. By understanding how skew works and moves we can increase the probability of success in the trades we place.